I am sure I am not alone here - if I am lucky enough to have a Saturday at home, when the kids are busy with their activities and the hubby is away. When the rain is lashing down outside I love to snuggle up in bed at 3 o'clock with a cup of tea, packet of chocolate digestives and my laptop. I love to chill out and watch some of my favourite 'makeup guru' videos. I am a big fan of Pixiwoo and Wayne Goss too but my favourite lady to watch is Lisa Eldridge. I love her videos and take a lot of my day-to-day make up inspiration from her. Lisa's videos are very well presented and her tutorials are very well composed. She demonstrates different techniques and tips brilliantly. I really like the fact that she uses an array of different products, not focussing on just high end brands all the time but showing us that the more affordable High Street products work lovely also. She indeed has great videos! I know exactly what you mean, sitting down jotting down names of products haha! It is definitely an addiction. Thank you for let me discover a wonderful woman ! She s really lovely indeed! 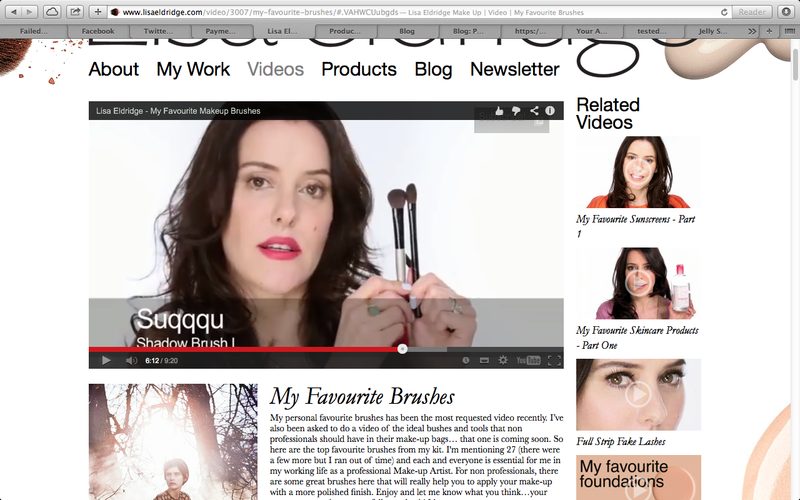 I love Lisa Eldridge videos, it always seems like she's having a chat to me personally.